Joe Evison hit an unbeaten 109. Bourne breezed into the Jaidka Cup final last night (June 20) with a crushing victory over Wisbech. They beat the Fenland side by 76 runs at the Abbey Lawns and will face Ramsey in the final at Peterborough Town next Wednesday (June 27). Star of the show was Notts Academy youngster Joey Evison who smashed a brilliant 109 not out to help Bourne post a formidable 220-2 off their 20 overs. He featured in a terrific opening stand of 163 with Jack Berry, who made 87. Wisbech were all out for 144 in the 19th over. The win keeps Bourne on course for a T20 trophy treble. 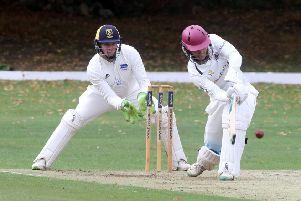 They hammered Uppingham by eight wickets on Monday in the semi-final of the Stamford Charity Cup - a game in which 16 year-old Evison hit an unbeaten 54 - and they play Uppinghgam again in the semi-final of the Stamford KO Shield next Monday (June 25). Bourne were Jaidka Cup winners in 2016 and runners-up last year.